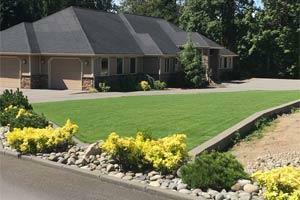 Don’t settle for bare dirt; our hydroseeding in Sumner can bring in the green! Brown dirt is boring. Without any plants, trees, bushes, or grass, the land seems barren and lacks character. But if you’ve recently cleared out a large section of land, sometimes, dirt is all that remains. 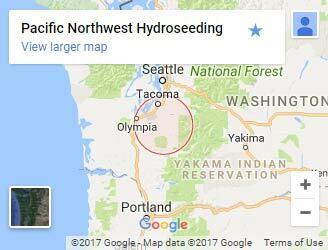 Fortunately, Pacific Northwest Hydroseeding can fix that for you! If you want to add grass to your landscape and you have a lot of land to cover, try using our hydroseeding in Sumner. Hydroseeding is an efficient way to quickly cover large sections of bare dirt with grass seed. And our experienced crew maximizes the chances of a lush, full, green lawn with a careful and precise application. Is hydroseeding the fastest method to get grass? No, hydroseeding isn’t the fastest way to get grass at your property. But it may be the most effective and the best value. Laying sod can give you instant gratification, but the costs quickly add up. Sod has to be packed, transported, and laid down properly to take effect. With hydroseeding, once the initial slurry is created, an even coverage can be done in a matter of minutes. And in a few weeks, you’ll have a fantastic looking lawn that will last for ages! Done properly, hydroseeding is practically guaranteed! Sod and hand seeding are difficult on sloped sections of land. But because the hydroseeder sprays the slurry, getting it onto hills and slopes is a cinch. Part of the hydro grass advantages is that the mixture has mulch and tackifiers included. This provides superior erosion control by allowing for optimal binding to the soil and makes it tight and compact. The cost of hydroseeding is relatively low, especially on larger properties. Hydroseeding is also praised for a having a uniform lawn when finished due to its application method. With proper watering, you can expect to see the results in as soon as a week! The lawn should be fully formed about a month after the hydroseeding process. If for some reason your lawn doesn’t grow when you follow are lawn care guide, don’t worry; our warranty means we’ll come by and give it another application completely free! Our local company will treat you and your property right!